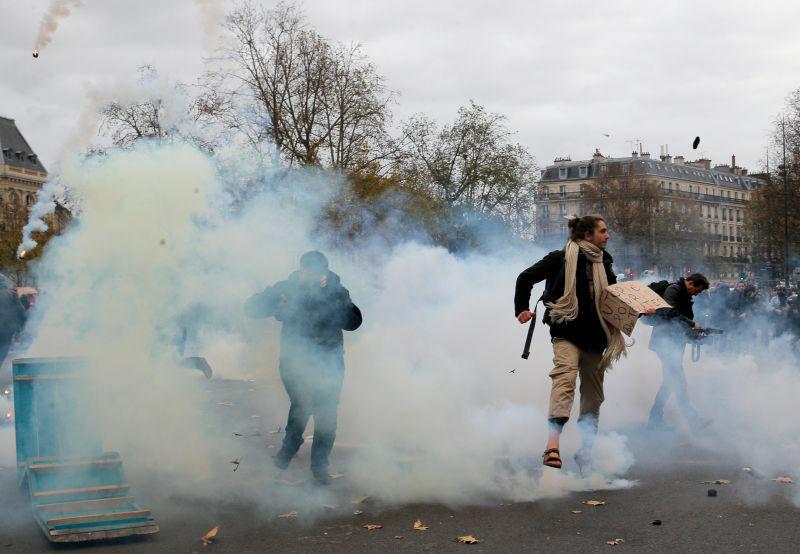 Paris is once again in tumult on the eve of the COP21 climate summit, a series of negotiations that activists hope will achieve significant strides where past gatherings have failed. 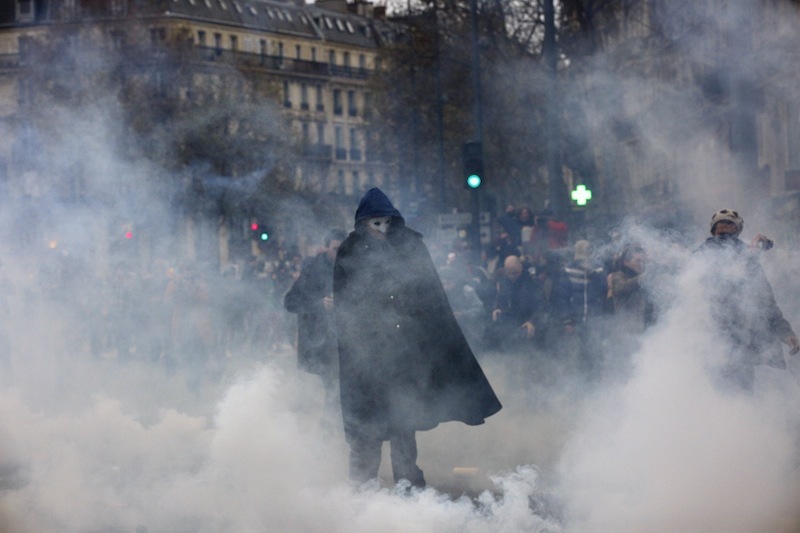 On Sunday, protesters clashed with police in the Place de la Republique as thousands more marched in the city to demand meaningful political action on climate change. The Telegraph reports that 100 people were arrested during the protest. One video shows a police officer pepper spraying a protester without warning, and yet another caught police dragging a protester on the ground. Protesters, some wearing masks, scattered from the area in a haze of tear gas. 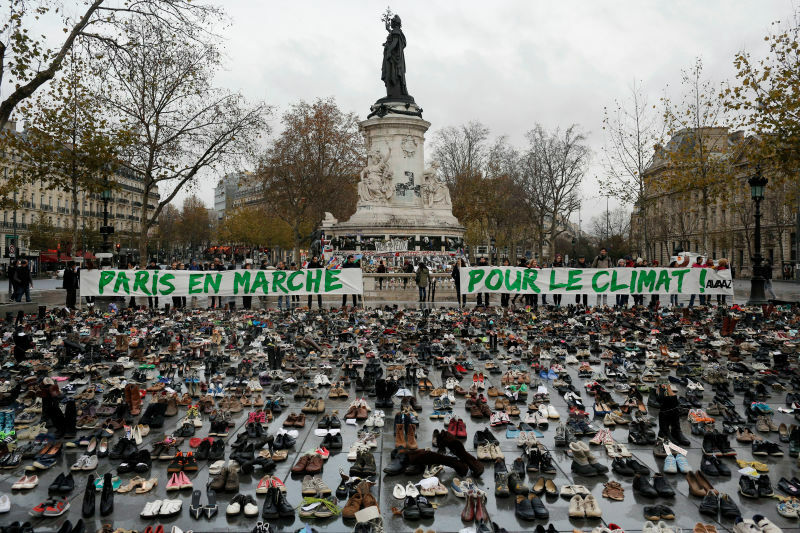 Before the skirmishes broke out, protesters had gathered peacefully at the site, setting thousands of shoes, including a pair belonging to the Pope, in rows, after they were warned by police not to gather in large crowds. Protesters have still gathered to peacefully demand action, though. French police told NBC News that about 4,500 people had formed a human chain after being told not to gather. Meanwhile, people are turning up in full force in other cities including Berlin, Barcelona, Jakarta, Nairobi and countless others around the world to demand climate action. In London alone, 50,000 people showed up to march on Sunday, according to the Guardian. [T]he scene at Place de la République was unfortunate. I actually had gone to the square to pay my respects at the memorial that’s been set up there, and then happened to see the beginnings of the confrontation. My experience was that there were lots of tourists who had nothing to do with the protests, and then additionally many activists that were not actively confronting the police. So as usual the more exciting confrontations get a lot of attention. I think there were a couple hundred protesters that were really actively involved in the confrontation...I am hopeful that the spirit of this morning’s events (as opposed to this afternoon’s) can really be reinforced.